We’re updating our Visual Guide for the TIE Fighter from The Saga Collection. Click below to check out our newly detailed Visual Guide page for this Toys R Us exclusive, and make sure to check out all of our additional information and galleries in our full review. There’s a strong possibility that you don’t know The Saga Collection TIE Fighter Toys R Us exclusive exists. Or if you do know about it, you might think it’s just a straight repack of the one released the year before it. You”d be wrong on both accounts. Did you also know it had a concurrent variation? This blink-and-you-miss-it Toys R Us exclusive is an incredible release thanks to its stunning paint job and beautiful packaging. Learn more about it in our Research Droids Reviews today! Be sure to leave your thoughts in our comments section, vote in the poll or comment about it on our Facebook page. Click the banner below for the direct link to the review! As always, you can also send your review requests via email if you’d like to see something that we didn’t cover yet. It’s time to finish up the figures in the New Millennium Minted Coin Collection. Let’s continue with Emperor Palpatine. He is the focus of our Research Droids Reviews today! Be sure to leave your thoughts in our comments section, vote in the poll or even comment about it on our Facebook page. Click the banner below for the direct link to the review! As always, you can also send your review requests via email if you’d like to see something that we didn’t cover yet. It’s time to finish up the figures in the New Millennium Minted Coin Collection. Let’s begin with Chewbacca. He is the focus of our Research Droids Reviews today! Be sure to leave your thoughts in our comments section, vote in the poll or even comment about it on our Facebook page. Click the banner below for the direct link to the review! As always, you can also send your review requests via email if you’d like to see something that we didn’t cover yet. ← Brand New TBS6 [P3] Figures Ringing Up For $.03 Again! There is good news for the UK and beyond regarding The Black Series [Phase III] 6″ Zuckuss figure. Hasbro is officially getting it out to collectors in the UK! It’s coming soon! Star Action Figures is taking pre-orders right now! It’s another Canadian Toys R Us exclusive! Who knows if it will ever come to the USA! Check out the C-3PO/R2-D2 Force Link 2.0 Two-Packs set. The figures look great and it’s one of the best 5POA exclusives Hasbro has ever produced. Learn more in our Research Droids Reviews today! Be sure to leave your thoughts in our comments section, vote in the poll or even comment about it on our Facebook page. Click the banner below for the direct link to the review! As always, you can also send your review requests via email if you’d like to see something that we didn’t cover yet. There is another…. Toys R Us exclusive NOT coming that way to the USA. JTA reader Sebastian W. has located a new Star Wars [Solo] Han Solo & Chewbacca 12-Inch Figure set at his local store in Asia. This newly revealed item may or may not come to the USA. We will have to wait for an official announcement from Hasbro on it. The packaging also reveals an upcoming Lando Calrissian figure. 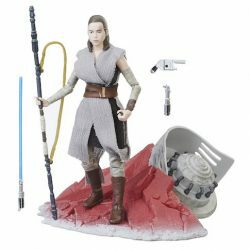 ← TBS6 [P3] Luke Landspeeder & Rey Speeder Hit RECORD LOWS At Best Buy! Our latest Visual Guide addition takes a look at the International Toys R Us exclusive Stormtrooper (With Blast Accessories) 6-Inch figure. Click below to have a look at our guide page. Make sure to also stop by our review as we take a complete look at this figure. NEW FIGURES! The Black Series [Phase III] Stormtrooper (With Blast Accessories) provides a strong example of the disconnect between Hasbro and the adult collecting community and how distribution is wholly in the gutter. It truly is. With retail dying a grim death, is there any hope in sight for American collectors with this figure? We don’t know. But maybe you won’t care. See this mediocre figure in our Research Droids Reviews today! Be sure to leave your thoughts in our comments section, vote in the poll or even comment about it on our Facebook page. Click the banner below for the direct link to the review! As always, you can also send your review requests via email if you’d like to see something that we didn’t cover yet. ← Black Series Archive Line Is Coming In 2018! We have another The Black Series [Phase III] 6″ figure Visual Guide for today’s update. Check out the Toys R Us exclusive Captain Phasma (Quicksilver Baton) by clicking below. We also have a full review of this figure right here. NEW FIGURES! She’s a day late and a dollar short, but superior to the first release. Find out why you might want to secure Captain Phasma (Quicksilver Baton) from The Black Series [Phase III] 6″ line in our Research Droids Reviews today! Be sure to leave your thoughts in our comments section, vote in the poll or even comment about it on our Facebook page. Click the banner below for the direct link to the review! As always, you can also send your review requests via email if you’d like to see something that we didn’t cover yet. Check out our sneak peek of the still-officially-unannounced The Black Series [Phase III] Captain Phasma (Quicksilver Baton) Canadian Toys R Us exclusive figure. It remains to be seen how this figure will be offered in the USA. Captain Phasma (Quicksilver Baton) would have been a lot more exciting if she was released instead of the straight repack that was part of The Last Jedi product launch push. The figure has a fantastic new head sculpt and the accessories are simple but lovely. If this were just a couple years ago, we could have expected a tweaked version of her in the basic assortment, but for one reason or another, Hasbro decides these make for great store exclusives (that many of us can never acquire). Anyway, the full review is coming soon, but you can check out the gallery and notes now. Toys R Us released two exclusive multipacks for The Original Trilogy Collection. The Naboo Final Combat set should be purchased for one reason only: the Kaadu. It received a tremendous update and still holds up well today. Find out why you need this set in our Research Droids Reviews today! Be sure to leave your thoughts in our comments section, vote in the poll or even comment about it on our Facebook page. Click the banner below for the direct link to the review! As always, you can also send your review requests via email if you’d like to see something that we didn’t cover yet. Toys R Us released two exclusive multipacks for The Original Trilogy Collection. We’re checking out both of them. First up is Endor Ambush. It’s not a great set at all. Find out why in our Research Droids Reviews today! Be sure to leave your thoughts in our comments section, vote in the poll or even comment about it on our Facebook page. Click the banner below for the direct link to the review! As always, you can also send your review requests via email if you’d like to see something that we didn’t cover yet.